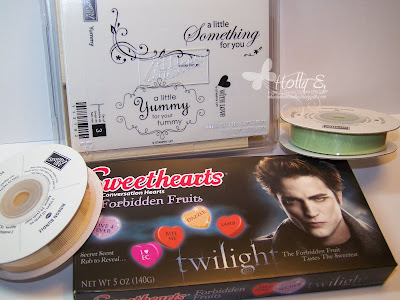 Hollybeary Creations : Blog Candy Time! Blog Candy is Over! Thanks for entering. Winners posted above! I want to Say a Big THANK YOU!! to everyone that visit my blog and for hanging in there with me.. So Blog Candy here we come.. And there will be 2 lucky winners! Leave a Comment in this post.. Which I will leave at the top all week! So you'll want to scroll down for new stuff.. I cleaned and I found some great goodies for you.. There are 2 packs of Memory Box papers, Retired Stampin' Up! Ribbons, Designer Hardware and A Muse Creative Candy..
Stampin' Up! Ribbon, the set "Yummy" and we can't have Blog Candy without some real Candy! I will pick a Winner on Friday! Oh what fun! Thanks for the chance to win! What a sweet chance to win!! Thanks for all your great ideas! You've got a great blog Holly. Thanks for taking the time to share your creativity with us. Thanks for giving us the chance to win you blog is Amazing! Twilight....I have heard it has such a cult following but have yet to see the movie or read the book! Well, Kristy...all I can say is to start reading the Twilight series and you too will see why we are so hooked!!!! Thanks Holly for another chance to win....I like item #2 as well!!! ps - I love my mac! Heard that you can't make it to Convention this year.. I am going to try to make it.. but I think next year might be better for me anyway... we all miss you a ton... I love your blog.. I should say both your blogs!! I just added a following link to my blog.. so come be my first follower!! Put my name in the drawing please. Brave Soul Holly to switch to the unknown Apple world. My friends with MAC's love them but after using my brotherinlaws laptop version for a week when I was without access to my PC I was happy to return to my troublesome Vista machine! Hang in there and you'll get the hang of it all. Mostly I found it was having to learn a different language and set of keystrokes that caused my brain drain. Thanks for easing the pain with blog candy for your greedy readers! Even with out the sweets we love your work and follow you with a light and inspired heart! Had to laugh with my secret word. The mysterious someone who assigns these knows me way to well. My word was tonal and since I'm a musician as well as a color freak its very appropriate on all counts. Thanks for a chance to win! Great videos, love the music you pick!